The mechanisms that underlie early embryonic development in humans and cattle are very similar. Therefore, LMU researchers argue that bovine embryos might well be a better model for early human development than the mouse system. 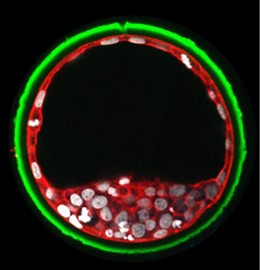 Wolf and his colleagues have used the CRISPR-Cas9 system in bovine embryos to delete OCT4, a gene that is known to play a key role in the regulation of pluripotency in mammalian embryos. In the mouse, loss of this gene results in the inability to generate cells that express a transcription factor called GATA6, while cells that express a marker of pluripotency named NANOG are not affected. “In the bovine embryo, we found precisely the opposite effect,” says Kilian Simmet, first author of the new study. “In this case, deletion of OCT4 inhibited the emergence of NANOG-expressing cells, while GATA6-expressing precursor cells developed normally.” A recently published paper had previously reported that human cells react to deletion of the same gene at the same stage in exactly the same way. In addition, this is not the only case in which the regulatory circuits that control early embryonic development in humans show greater similarity to those employed in bovine embryos than to those that operate in the mouse system.